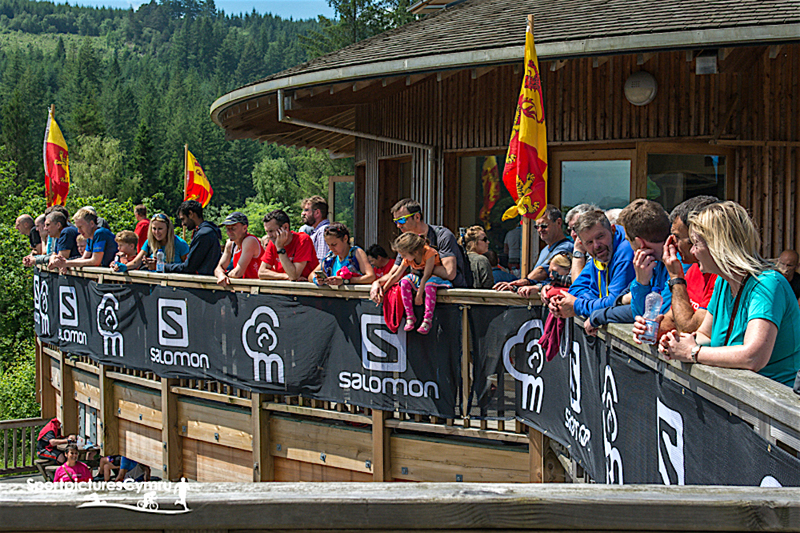 Big crowds, perfect weather, top-class racing and a stunning backdrop welcome home hundreds of trail runners at Coed y Brenin for the 2016 Salomon Trail Marathon Wales. 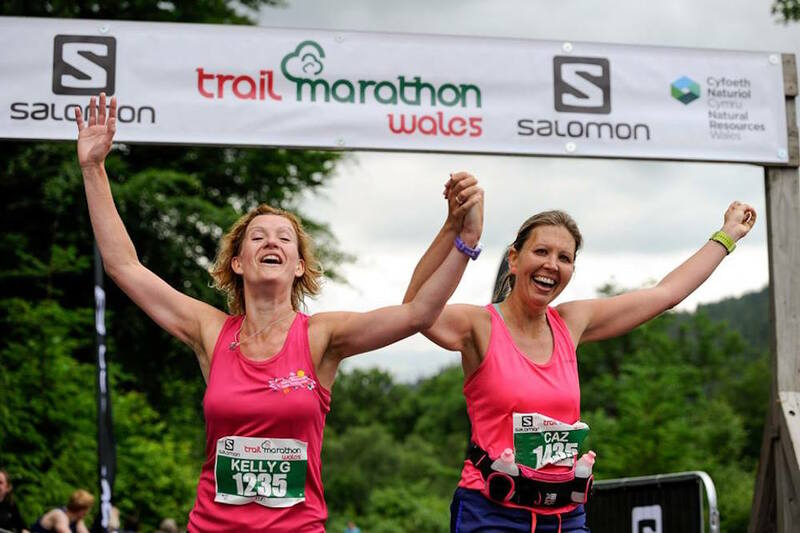 The 5th edition of the Salomon Trail Marathon Wales at Coed y Brenin Forest Park in North Wales on Saturday saw participants from across the UK and Europe take on what is now renowned as one of the toughest and most beautiful trail marathons. With perfect weather conditions, thousands of spectators and a natural amphitheatre for the race start and finish, the atmosphere at the event was unrivalled. 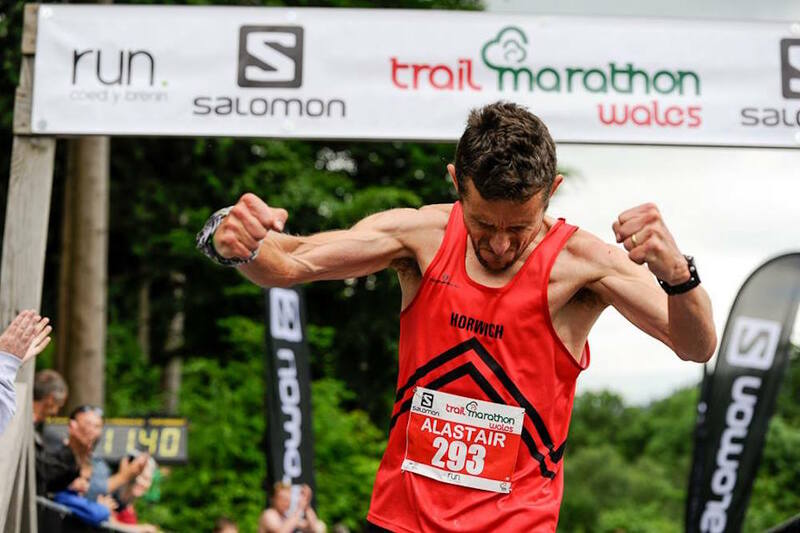 Voted in the Top 7 Trail Races in Europe by Runners World last year the bar was set high and following 26 stunning and challenging miles, most could only but agree, with race winner Alastair Murray describing the route as “brutal”. 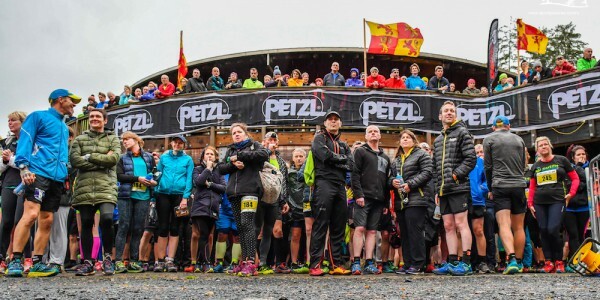 The visitor centres at Coed y Brenin Forest Park were once again transformed into an exciting race arena with a festival feel, and yet again the resounding feedback from runners and spectators alike was highly positive. In 5 years Salomon Trail Marathon Wales has grown to be one of the UK’s premium trail marathons with runners traveling from as far a field as the US, Denmark, Germany, Spain, Sweden and Ireland, and it is easy to see why the race, which take in some of the most technical and beautiful aspects of this 9000 acres forest in the heart of the Snowdonia National Park, has cemented itself as one of the top events on the UK trail running calendar. 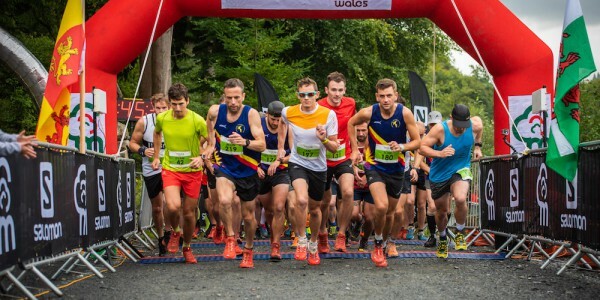 Racing got underway at the traditional 9.00am, with temperatures in the mid-teens and a gentle breeze, and as Horwich athlete Alastair Murray and Heanor RC runner Gordy Smith strung out the field it was clear that the early pace was very hot. Smith and Murray continued to battle it out for much of the first half of the race as they both passed through halfway in around 1 hour 34 mins. However, as the relentless miles of the second half of the race wore on, with the new Coed Ganllwyd section particularly taking its toll, Murray drew clear and showed immense strength over the latter miles to extend his advantage to a massive 11 minutes as he romped to a famous victory, ecstatically punching the air as he crossed the line in 3:11:38. Behind Allen Smalls from Colchester (3:22:06) and Jamie Masters of St.Austell (3:27:15) made their long trips worthwhile and they both carved their way through the field over the second 13 miles to complete the podium. Early co-leader Smith faded over the second half to finish an eventual 8th place. 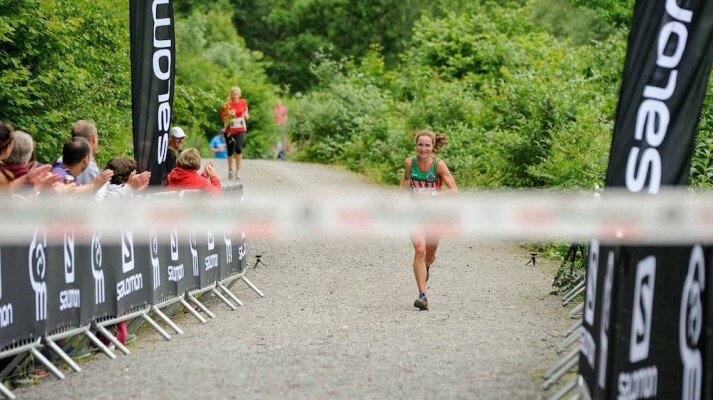 In the women’s event 2014 winner, Eryri Harrier and Welsh international Andrea Rowlands was back at what she later described as “one of her favourite races of the year”, and put on a demonstration of majestic, solo trail running to win the women’s race by a massive 23 minutes. Behind Arena 80 AC runner Eluned Malone ran a strong second half of the race to come through for an excellent second place. 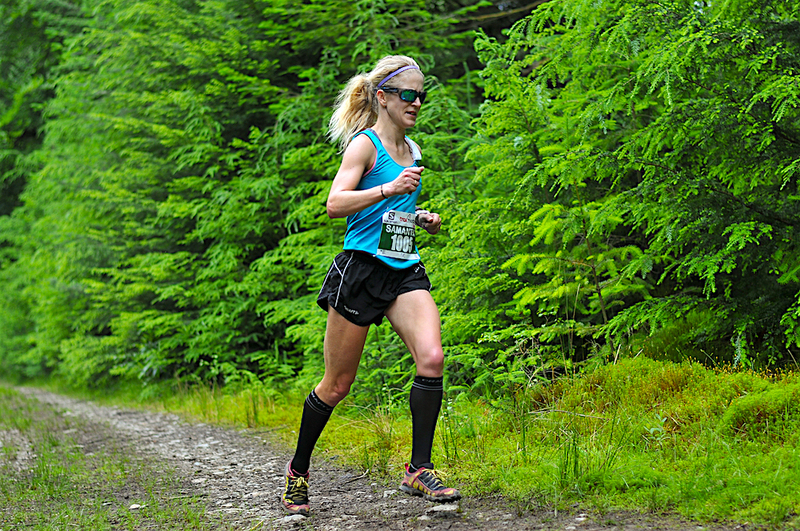 Making up the top 3 Mary Grace Spalton added a second third place (2015 and now 2016) to her win of 2013 and second place of 2014. 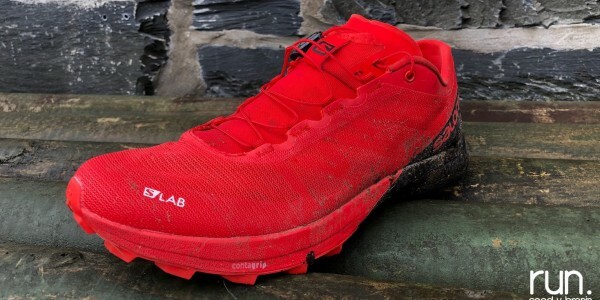 In the supporting half marathon event teenager, Salomon athlete and GB international Max Nicholls was making his debut in the event, and was on his first visit to Coed y Brenin. 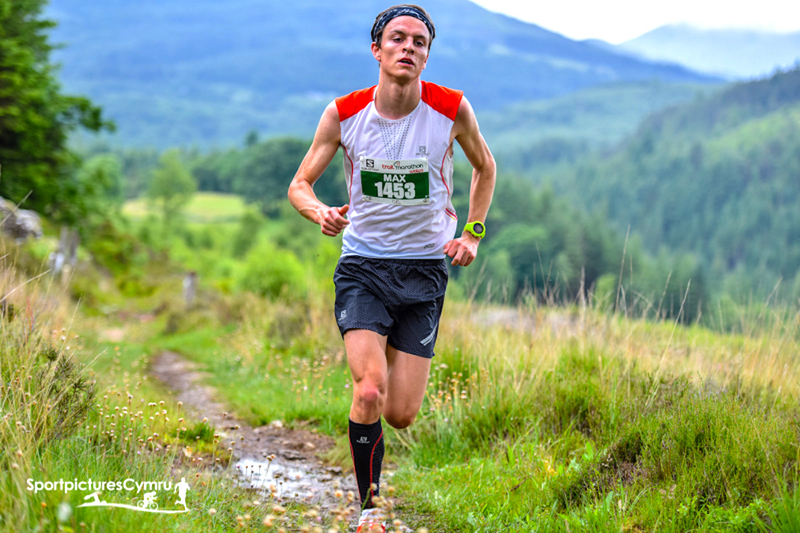 The Kent AC runner has been in tremendous form in the last 12 months, winning the Snowdon Super Cup last July, ahead of a superb 6th place at the World Mountain Running Championships in Betws y Coed last September. With seasoned talent in the form of Belgrave runner Alex Miller and Sarn Helen man Ken Caulkett also on show, 19-year old Nicholls would have to make all the running. 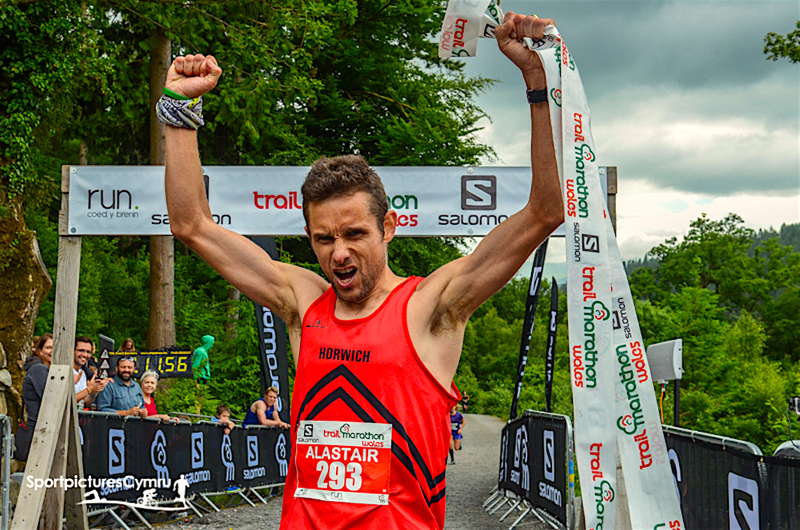 Such was the case as he crushed the opposition in a classy demonstration of front running, leading from gun to tape in a time of 1:22:10, less than 30 seconds outside of Welshman Andrew Davies’ course record from 12 months earlier. Miller and Caulkett ran strongly for 2nd and 3rd respectively, a full 8 minutes behind Nicholls by the time they got to the finish line. 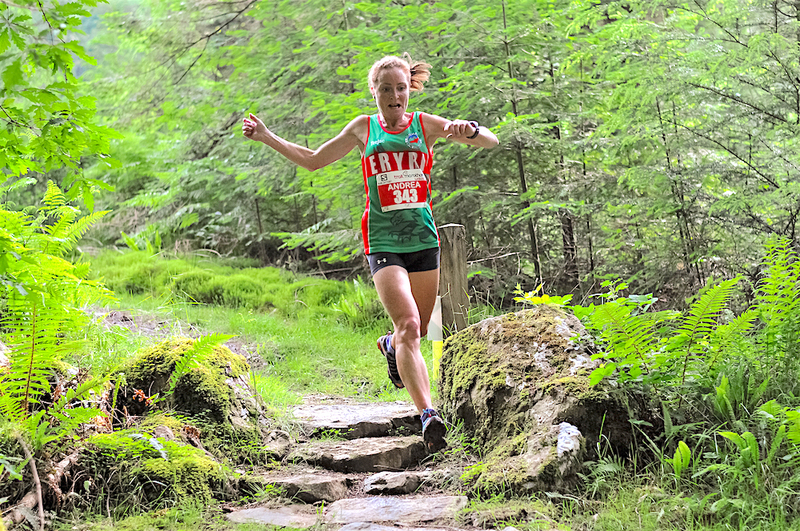 In the women’s half marathon 2015 TMW marathon champion Samantha Amend was back in Wales. 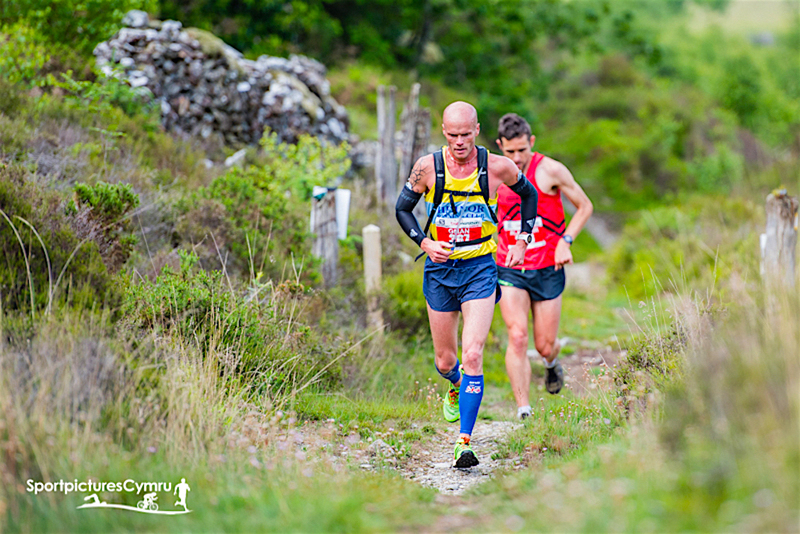 The Belgrave Harrier had 12 months earlier cruised to the win in Coed y Brenin, however with GB selection around the corner at the World 100k the 37-year old decided to drop down to the half race. In what was to be easily the closest race of the day, Amend held on for the win in 1:38:07, with Claire Walton (1:38:53) claiming second ahead of Emma Gould (1:39:33) in third. Testimony to the quality of this race was the fact that the first 5 runners all broke the course record, with Amend carving 6 mins from the previous course best. “I have to be honest, the event gets better every year. Each edition of the race has been very different, in weather conditions if nothing else. 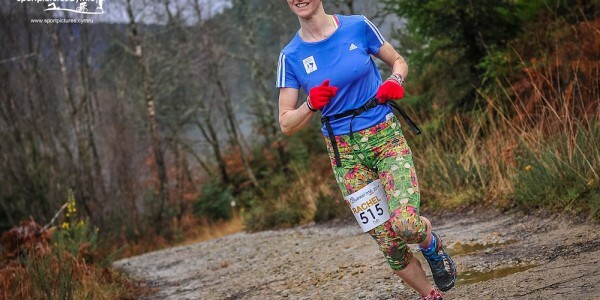 But this year in particular the atmosphere was even better than what we have witnessed at Coed y Brenin in the 4-5 years I have been organising the event. There was so much positivity and fun out there! “Most of all the real winners this year are each and every one of the competitors who run this event. 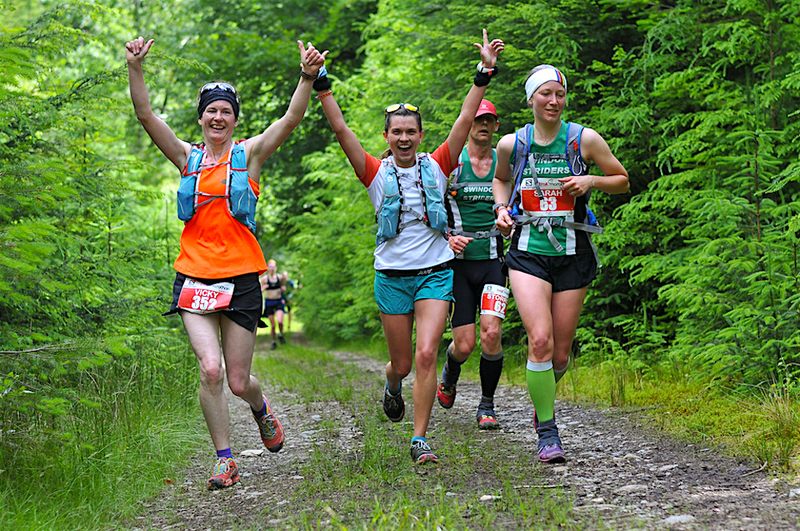 Their enthusiasm, infectious laughter and sense of fun, which seems everywhere on race-day, really does make for an event which makes you smile. “There were tears of joy, pain and massive releases of emotion as runners poured over the finish line here today, and I am proud as to what we have achieved.